Last Sunday I joined the 36th Ave Winemakers in my aunt and uncle's backyard to help bottle the 2009 Mueller. Once the last golden carboy was drained, and the pristine white wine bottles filled, I had to snap a photo with my phone. As if it didn't already look like a scene one might set up for Gourmet Magazine, I wish I had taken a shot of the homemade goose sausage and the kalamata olive shortbread cookies that others had brought. Each time I visit my Uncle Steve and Aunt Rae's house, a wave of nostalgia rushes over me. Playing hide and go seek with the cousins at family reunions, picking raspberries in their garden, always finding something wonderful to nibble on in their kitchen and always admiring their art. Mark and I are fortunate enough to have two lilac bushes on our property, one is purple, the other white. I put a vase of lilacs in every room of the house while they were in bloom. Lilac season is always too short. Prunella digs them too. I haven't been overly inspired to cook lately. Mark made a lovely homemade squid marinara for me the other night, and I did saute some mushrooms with a basil pesto over salmon recently, but all my creative energy is sucked up with the New Vineyard Table Catering project, which is so very exciting! I haven't even been gardening. I did manage to start some nasturtiums and I do plan to get some weeding done sooner or later. of all things, I've been inspired by all the poppies and peonies that are starting to bloom and I definitely want to put those on the list to plant next year! I did manage to catch an attractive glimpse of this fast b.l.a.t. that I made for a recent road trip with Mark. On another note, I finally forced myself to take another creative writing class at the Richard Hugo House. Creative non-fiction! My favorite. I'm suppose to bring 4,000 words to work with. At first I found this to be impossible and limiting. But I already know what I am going to write about, even if it crushes me. It's called "expressions of my father." I'll post it when I get to a point when I am feeling more complete about it. READ THIS! Blood Bones and Butter! 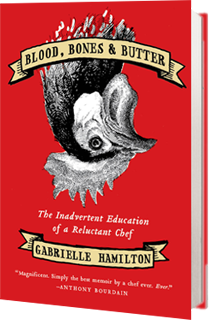 To get my creative juices flowing, all I really needed to do was read Blood Bones and Butter by Gabrielle Hamilton. Mentally delicious. I needed a kick start- something to move me and it is full of gritty inspiration. Yes of course it's about food and chefs and struggle, and many other things that make me say, "ahh," out loud on a crowded airplane, but when was the last time I did that? mmmmm satisfying. I've been seeking inspiration, and manifesting loveliness. I'm on a creative mission. What I am finding is that if you put it out there into the world, it will start coming back to you. Like exercising anything, the hardest part is starting. But once you are in a good rhythm, things come so much easier. There has been an abundance of inspirational conversation lately with great chefs like Kristen Schumacher and winemakers like Leroy Radford and I want to keep it all flowing. And on that note- a little inspiration, aka Bryan John Appleby, Cliffs Along the Sea. "I am roaming through the darkness, I am rambling through the night. I will find you soon my darlin, be sure and hold the light. Love those lyrics! Loved your blog post! Can't wait for expressions of my father. It will be hard for you to write and hard for us to read but I know it will bring a smile with the tear. Your pictures are lovely.